The Vietnam flag was officially adopted on November 30, 1955. The gold five-pointed star symbolizes the five elements of the population – peasants, workers, intellectuals, traders and soldiers which unite to build socialism., while the red symbolizes bloodshed, and the revolutionary struggle. While the red color of the flag represents blood and is a color of communist flags. 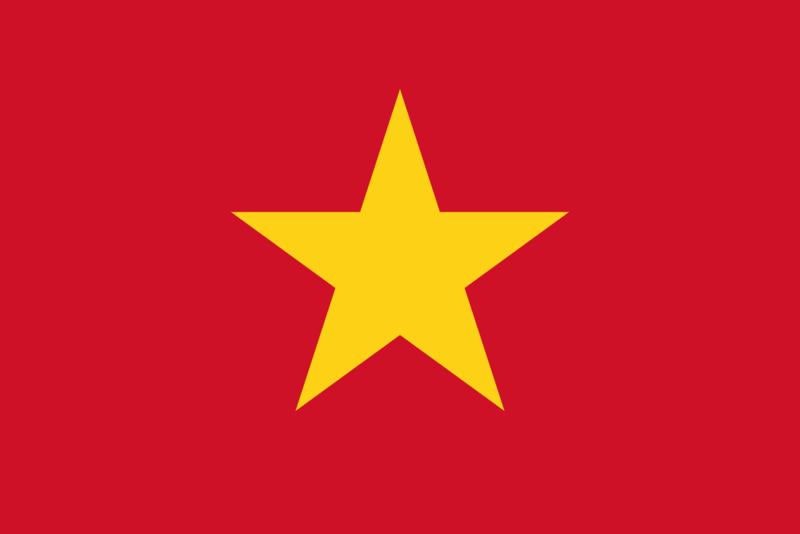 The yellow star in the center represents the people of Vietnam. French troops returned to Indochina in October and restored colonial power to the south. However, on March 2, 1946, the Vietnamese National Assembly adopted it unanimously as the national flag of Vietnam. On 30 November 1955, after the Geneva Conference and the definitive independence of North Vietnam, the design of the flag was modified and the size of the star was slightly reduced. After the end of the Vietnam War, in 1976 the flag was also adopted in the territory of the former South Vietnam. The Vietnamese natipnla flag was adopted by the Democratic Republic of Vietnam on September 5, 1945, but after North Vietnam captured Saigon in 1975, it later became the national flag of Vietnam, which formed the July 2, 1976.